There are only 7 balusters. If I could replace these 7 without too much trouble, I would attempt the 87 on the first and second floor. 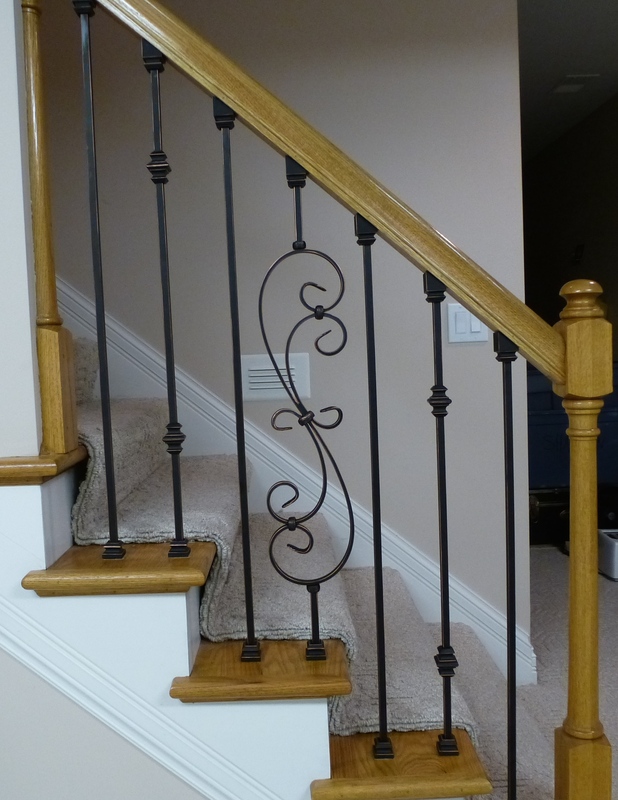 I purchased the parts for this job at Cheap Stair Parts - Iron Balusters, Handrail, Treads and Accessories.. I only ordered the parts necessary to complete this small staircase. I could have saved some money by buying everything for the whole job at once but, having never done this before, wanted to see how hard it would be before making a large commitment. I still thought that I might have to pay a pro, but happily that was not the case. The job turned out to be pretty easy, if one just takes their time and measures carefully. Count the number of balusters and decide on a pattern. There are a multitude of styles and finishes from which to chose. The most common I have seen in homes around here are black. You can also purchase solid or hollow. We went with the solid, even though they cost a little more. We (my wife has a big say in what goes into the house) decided on oil rubbed copper. The description is a bit of a misnomer as the color is black with the edges showing a copper tint. This compliments the brown wood of the railings and we are happy with it. The oil rubbed copper is an upgrade and each baluster cost an extra $1.25. We chose a pretty neat design with an S Scroll and double knuckle in addition to plain balusters. In addition to the balusters, you need to buy shoes. These shoes are a necessity if you are replacing wooden baluster. Not necessary for new construction. So I needed 14 shoes - 7 flat shoes for the base and 7 pitch shoes for the railing (top of the baluster). $107 for all of it included $30 for shipping. The larger the order the smaller shipping costs become as a percentage of the order. When you order around $1500 or more the shipping is free. So if you have any friends that might want to order at the same time your savings could be significant. After unpacking it, check for any defects. In our case everything was perfect and the order was complete. 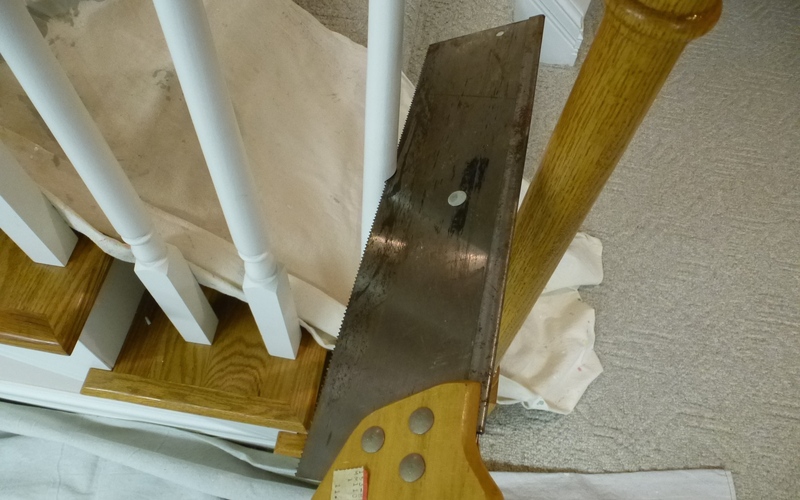 After cutting the baluster in half, slowly rotate the bottom half and it should be easy to remove from the hole. Then rock the top half back and forth to loosen it up until you can pull it out. 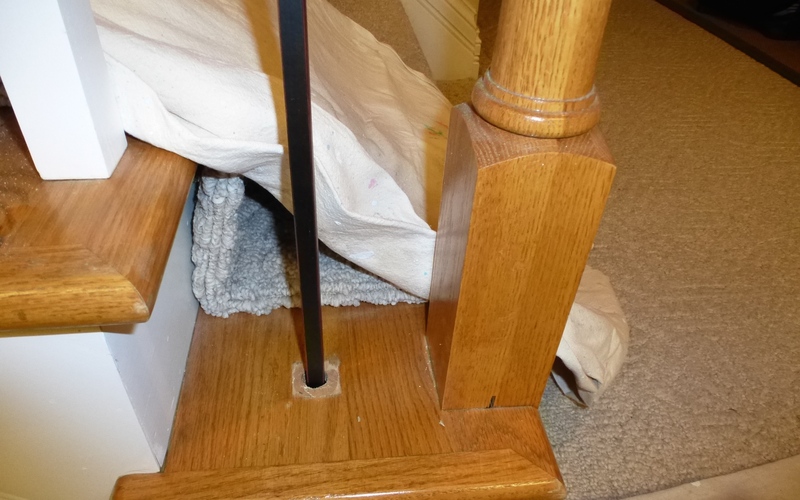 On mine, the tops of the balusters were pinned. Sometimes the pin came out and sometimes it didn’t. On those recalcitrant pins, I just tapped them up out of the way with a hammer and screwdriver. I decided to just cut one old baluster at first and see how the new baluster would fit before proceeding. 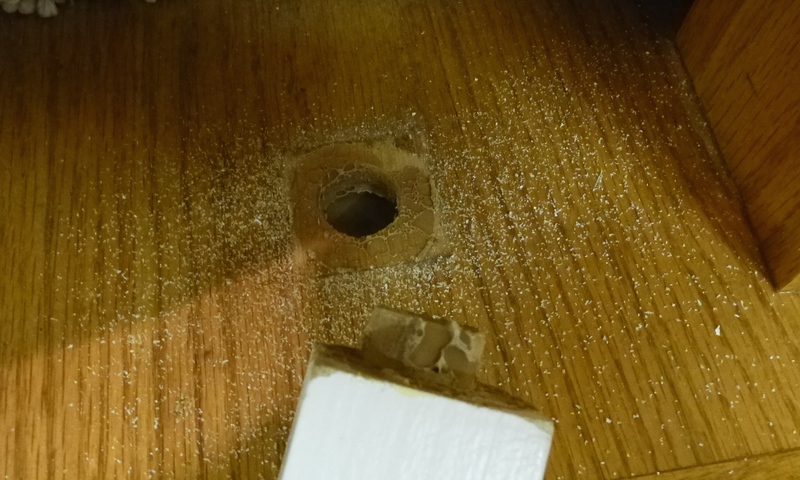 So using a tape measure, check the distance from the top hole to the bottom hole. As an aside, it’s important to measure every one individually as you proceed. They are different lengths. Your new balusters will be long enough for all applications and you will need to cut them to the proper size. After taking the measurement a couple of times, I added 7/8th of an inch to the measurement and cut the new iron baluster to that length. 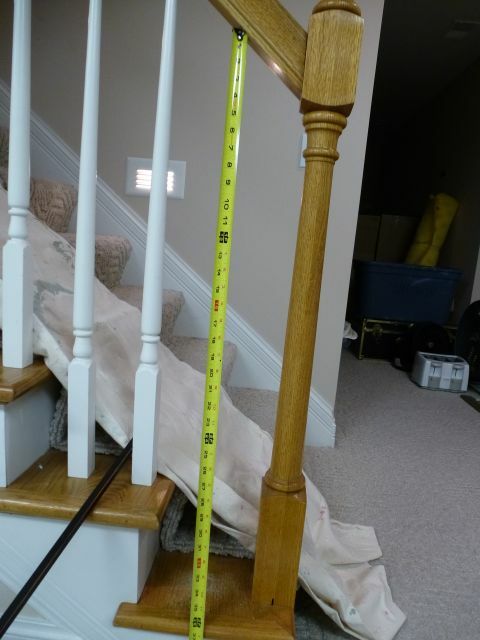 Therefore, if your top to bottom measurement is 36 inches, cut the new baluster to 36 and 7/8 inches. 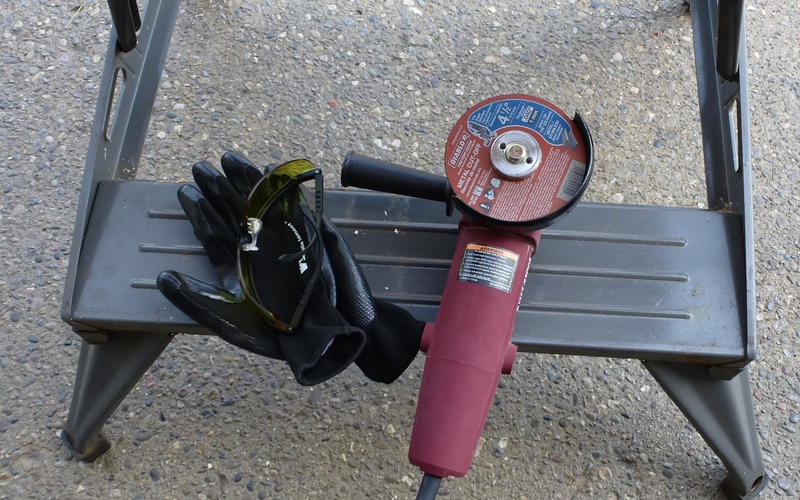 To cut the iron baluster, I used a 4 ½ inch grinder that I bought at Harbor Freight for $25 and I added a metal cutting wheel from Home Depot. The cutting wheel cost only $2.00 and worked great. 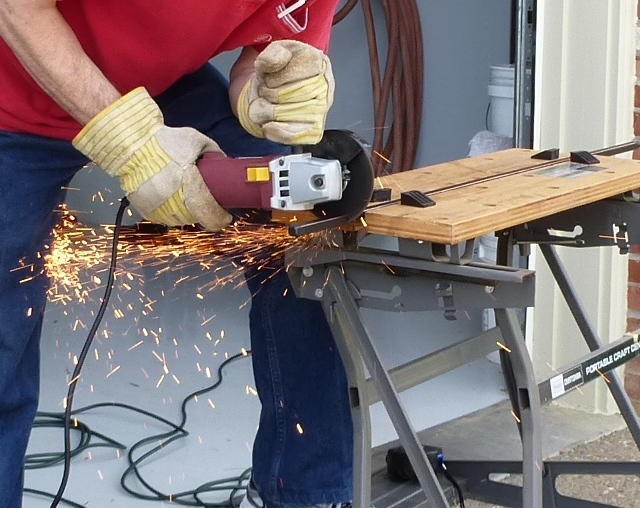 You don’t need a chop saw or a band saw. Always wear eye, hand and hearing protection. I made all the cuts off the bottom of the new wrought iron balusters because that ensured the pattern would line up. 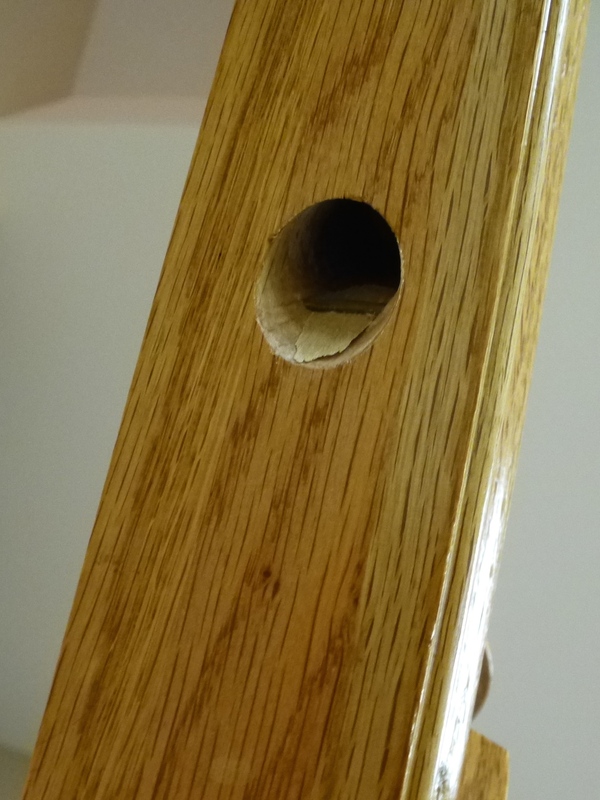 The top of the new balusters are tapered to enable you to slide them easier into the holes in the handrail. If you cut the top off, you will lose this advantage and they will be harder to install. After you make the cut, try it out for fit. One down 6 to go! You can notice the unfinished area left by the wooden baluster. A good reason to use the shoe. I cut two more then decided to install the first three permanently. I could have done all seven at once but was still unsure of my ability. 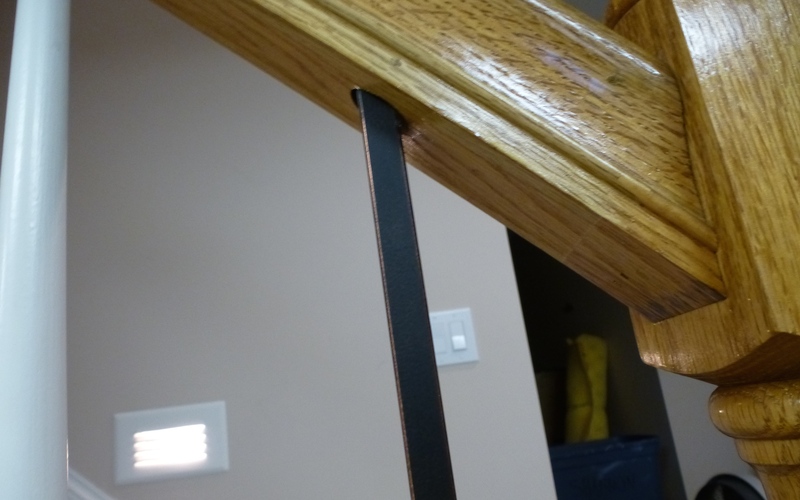 After cutting three new balusters and test fitting them – I slid on the shoes and tightened slightly with a 2.5mm allen wrench. The new balusters need to be glued in with epoxy cement. The epoxy from cheapstairparts.com was overpriced for my small job so I bought some Gorilla Glue epoxy at he local Home Depot. Messy stuff. Use with care. I squirted a little epoxy into each baluster hole on the stairs and mixed it up with a screwdriver. For the top, I mixed a gob of epoxy on the cardboard and spread it on the top of the new balusters one at a time as I installed them. I used the Gorilla Epoxy because it dries clear. Some epoxy glues are tinted. It tends to run a little so I used painters tape at the top of the new balusters to prevent it from running down. That's about it. You can do this if you take your time and measue twice. I have already ordered the parts necessary to completely replace all my wooden balusters and will save around $800 by doing the job myself. I am going to try epoxy putty for the top of the balusters instead of the liquid as this will eliminate the dripping and need for masking. Will post a pic of finished job when complete. Sorry for my inability to embed the photos in the text. Very nice. Are you going to change the wood stain color too? That yellowish oak stain looks dated next to your iron balusters. Love the double knuckle & S scroll designs you chose. I can't believe you have 94 of them. Smart idea to tackle the smaller, basement project first. By the time you reach the second floor, you'll be a pro. Thanks Egga, I'm stuck with the oak color since I've got a ton of matching oak flooring throughout the house that would be too labor intensive to re-stain. I think this update gives a nice look as the copper shows a bit better in person then on the photos. It was a fun project. Fun project? Oh, I wish I lived in a house that had "fun projects." 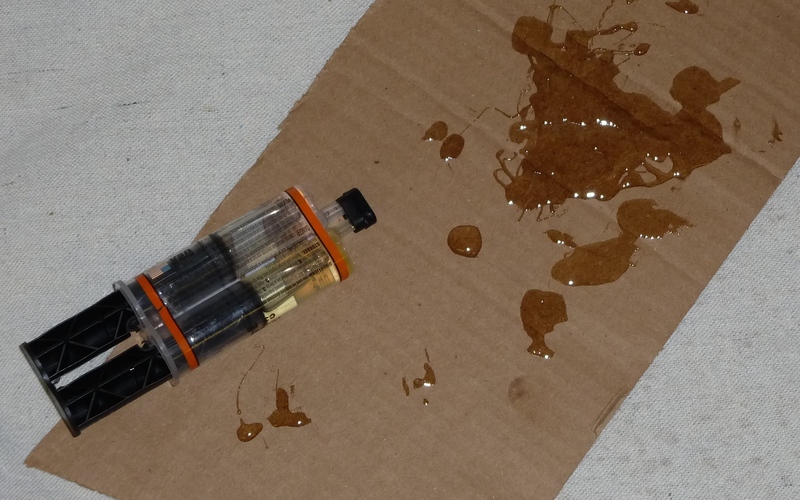 LOL Maybe the fun comes from the fumes from the epoxy. You can take great pride in what you've accomplished, the skill you've learned and the money you've saved. Kudos to you. We're planning on doing the same project soon, thanks for the wonderful info in the post! I'd love to build a bannister. I need two---one on each side of the last four steps in my staircase. Do you think it's hard? I can't figure out how the knoll post is secured because I haven't bothered to research it yet. You'd want to use something that dries rock hard. These balusters are super solid as the epoxy dried solid. I am getting the next shipment of balusters Monday and will probably use the epoxy again, but I'll let it set up a bit before applying to the top of the balusters. For the bottoms, it doesn't matter because it sits in the hole. A little drip won't matter because the shoe covers it up. 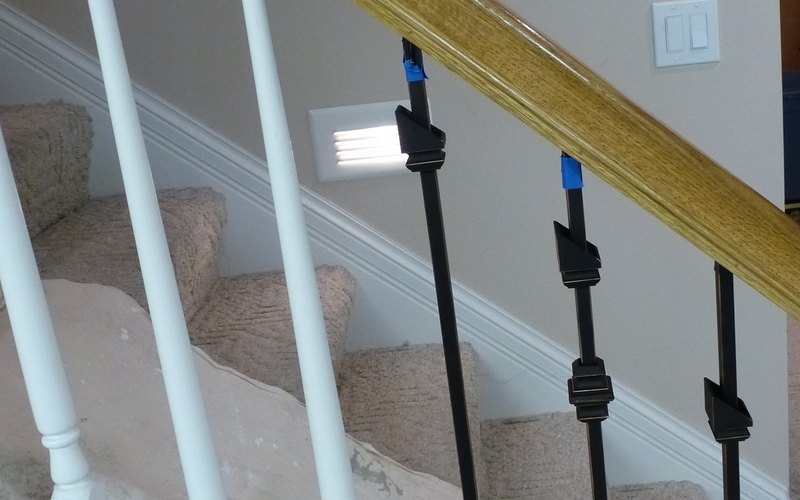 Don't forget that these balusters are actually holding up the handrail (especially on the longer runs) so need to be secure. That seems like a big job - kudos to you for doing such a good job with it.